A broken necklace was gifted to me recently, and I was able to construct a nice necklace by adding ivory seed beads, plus sections from a Galalith chain (from a different broken necklace). The Galalith chain is fragile so I won't be surprised if it doesn't last long in this incarnation. The beads and chain date from the first few decades of the 20th century. As a technical note - Galalith was the main trade name for a semi-man made material usually called simply "casein", especially in England. It was made starting around 1895 by curing casein, the main protein in milk, with formaldehyde. Based on comments I've received from others, this style of carved bead was meant to imitate similar beads that were made from real ivory. I've seen some of the ivory versions, but alas, I did not buy them (even though they were available in another US state) since I did not want to "import" them into California and then be unable to ever re-sell them. Wish I had thought to photograph them...if anyone has a pic of similar ivory beads, I would love to get a copy for my research! 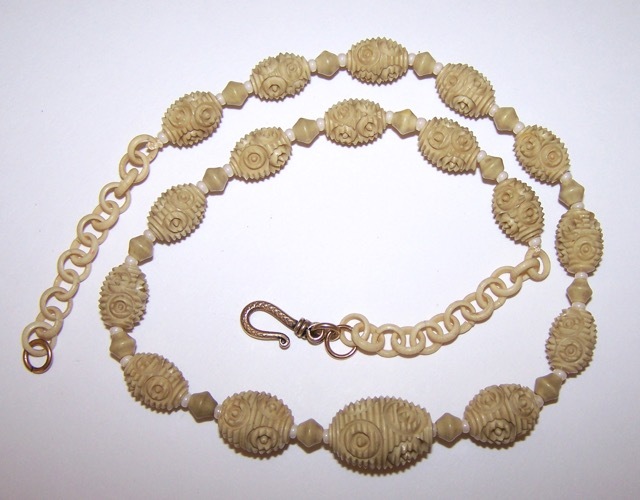 Galalith beads are often found in similar carved shapes, some two-tone, with an outer colored layer cut away to reveal a (usually) white or cream interior. You can test for Galalith by running the bead under hot water and detecting an odor of burnt milk - or what I think smells like wet dog hair. But many people have told me they don't think it smells like wet dog hair at all.